It’s almost Valentine’s Day! If you’re looking for something cute to make for your boo thang, or a totally instagrammable Galentine’s party food, I’ve got just the trick. 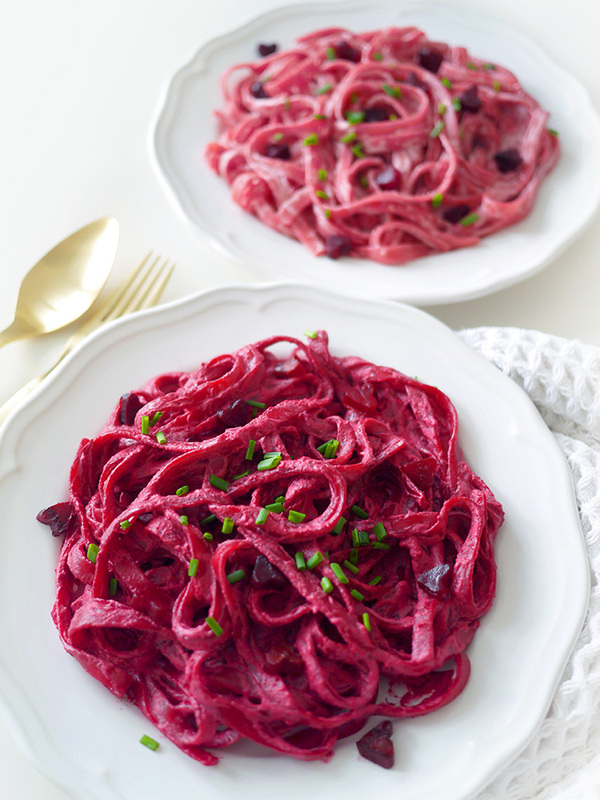 This vibrant pink pasta with beets (complete with little beet hearts!) is healthy, vegan, dairy-free, and oh-so-delicious. And if you’re in a time crunch, read to the end – I’ve got a coupon for $10 off your groceries plus free delivery! More time snuggling and less time last-minute stressing at the grocery store. Now let’s get started on the beets. Take the largest ones and cut them into steaks no more than 1 cm thick. This is what you’ll use to cut out the heart shapes. Brush them with olive oil so the colour stays bright and they don’t dry out in the oven. 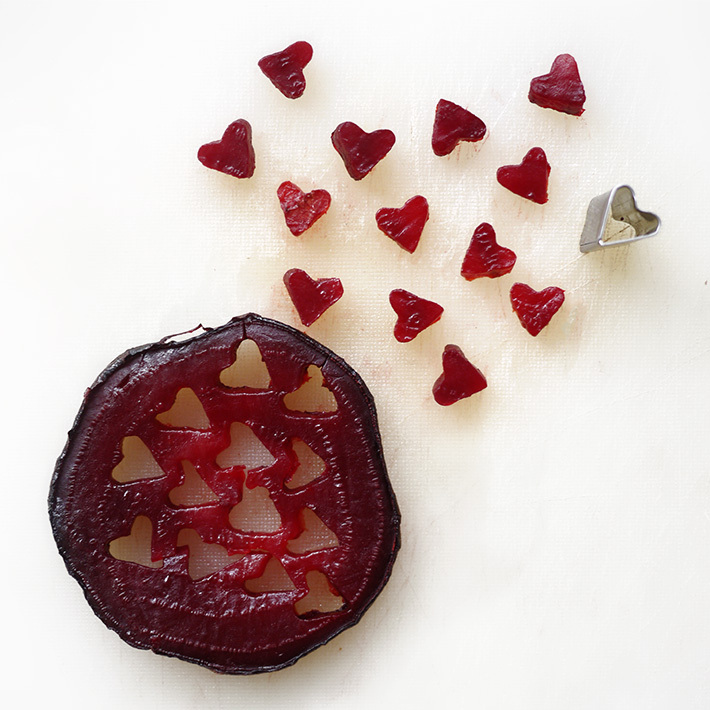 The rest of the beets can be chopped into chunks. Roast in the oven at 400 degrees F for about an hour. Once a fork can glide through, take your teeny tiny cookie cutter (I got mine off Amazon for cheap, as part of a set) and cut out your hearts. For the pink vegan “alfredo” sauce, drain your soaked cashews and add them to a blender with the juice of one lemon, minced garlic, Earth Balance, salt, white pepper, and about half a cup of the almond milk. Blend until smooth. If it’s too thick, add more almond milk little by little. 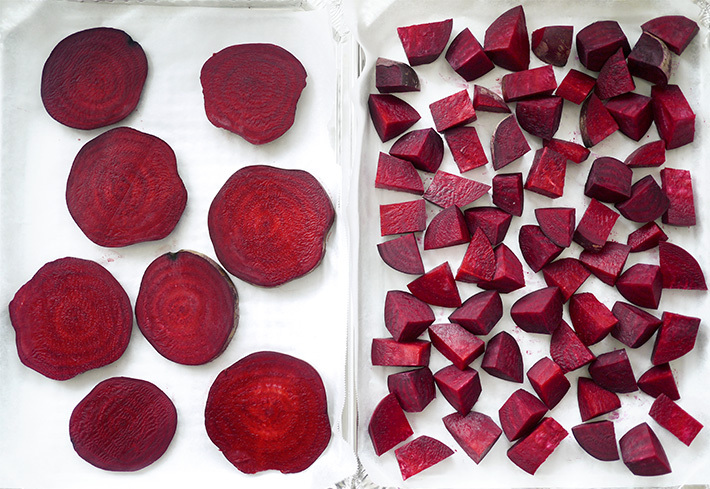 Add a few pieces of roasted beets to the blender – if you want a lighter pink colour, keep it to 2-3 chunks. For a more vibrant hot pink, use 5-10 chunks. As you add them, you may need to add a little more almond milk, too. 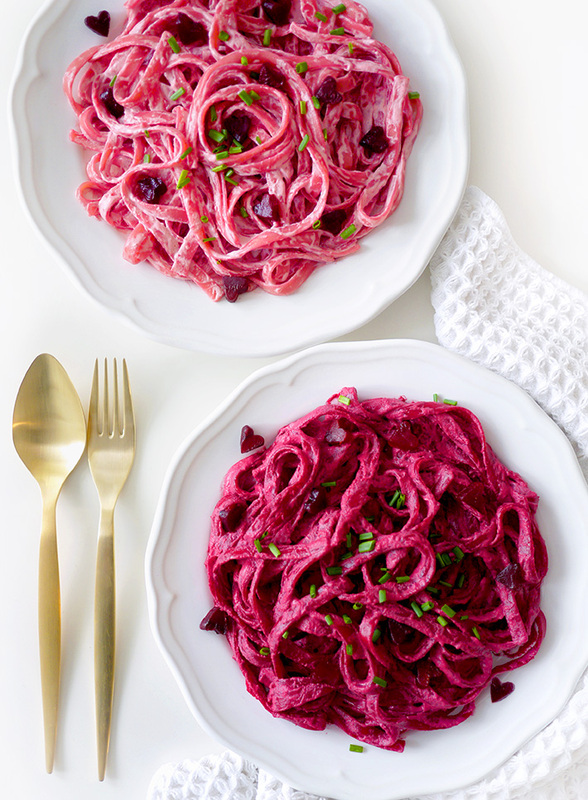 Boil and strain your pasta, stir in your pink pasta sauce, and decorate with a few beet hearts and a sprinkling of fresh chives for contrast. 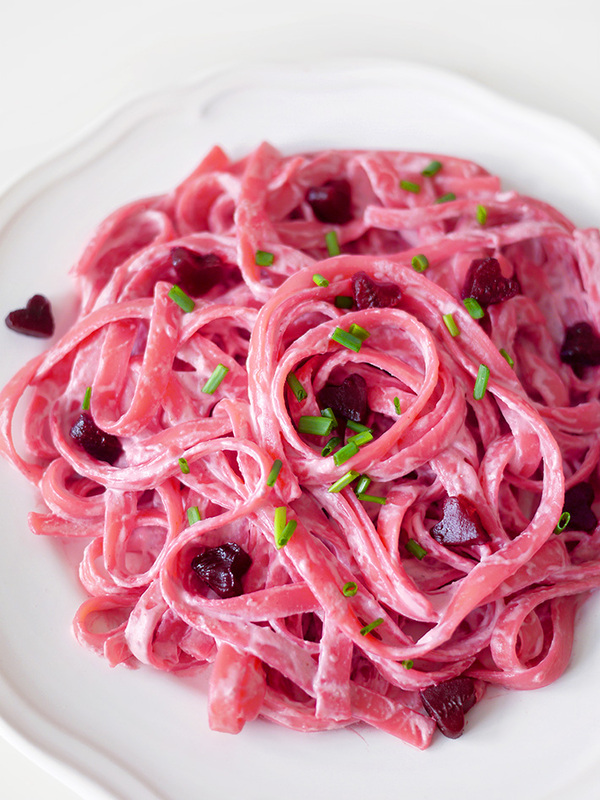 Sure, this pink pasta recipe is a bit of a labour of love, but c’est l’amour! And now for that coupon I promised you earlier: I’ve been hella sick this past week and haven’t been able to grocery shop since I’ve been cooped up at home. I discovered Instacart and they really saved me. I chose what I needed online and it arrived at my door 2 hours later! If you want to try it out, here’s $10 off your first order with them, plus free delivery! I love this idea and can’t wait to try it – thx for sharing!